Dogs aren’t just man’s best friend, they’re kid’s best friend too. Watch a trailer for Disney Junior’s new Puppy Dog Pals TV show, premiering on Disney Channel Friday, April 14, 2017, at 10:30am EDT. 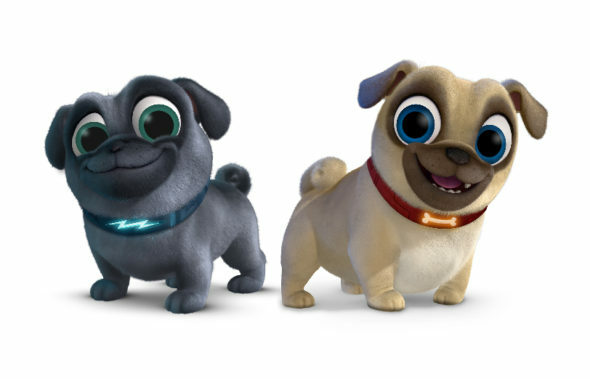 An animated children’s series from creator Harland Williams, Puppy Dog Pals follows pug brothers Bingo and Rolly and their owner Bob (voiced by Williams, who also writes the series). Puppy Dog Pals stars Issac Ryan Brown as Bingo, Sam Lavagnino as Rolly, Tom Kenny as A.R.F, and Jessica DiCicco as Hissy. Guest voice actors in season one of the Disney Junior show include Huey Lewis, Patrick Warburton, Jack McBrayer, Yvette Nicole Brown, Leslie David Baker, Cheri Oteri, Jill Talley, Mo Collins, Bob Uecker, and Tress MacNeille. Disney Junior’s pugtastic new animated series “Puppy Dog Pals,” created by comedian Harland Williams, debuts FRIDAY, APRIL 14 (10:30 a.m. EDT), with two back-to-back episodes on Disney Channel and will also become available that day on the Disney Junior app and YouTube page. The show follows two fun-loving pug brothers, Bingo and Rolly, whose thrill-seeking appetites take them on exhilarating adventures throughout their neighborhood and around the globe. Williams also serves as consulting producer and writer and voices the role of Bob, the pups’ devoted owner. Sean Coyle (“The Awesomes,” “Mickey Mouse Clubhouse”) serves as executive producer. Whether embarking on a mission to help their owner Bob or assisting a friend in need, the pugs’ motto is that life is more exciting with your best friend by your side. Along for the ride is their community of colorful animal pals including Bob’s cat Hissy and A.R.F., the lovable robot dog created by Bob. Each episode features two 11-minute stories that showcase Bingo and Rolly’s similarities and differences while demonstrating positive lessons about friendship, problem-solving, collaboration, creativity and adventure. Recurring guest stars include musician Huey Lewis as Bulworth, the junkyard dog; Patrick Warburton (“Family Guy“) as Captain Dog, the star of the pups’ favorite television show; Jack McBrayer (“30 Rock“) as Hedgie the hedgehog; Yvette Nicole Brown (“Elena of Avalor“) as Daisy, a kind German Shepherd; famed sportscaster Bob Uecker as a baseball announcer; Leslie David Baker (“The Office“) and Cheri Oteri (“Saturday Night Live“) as neighbors Frank and Esther Exposition; Jill Talley (“American Dad“) as bossy pup Cupcake; Mo Collins (“Fresh Off the Boat“) as Strider, a fast-talking sheep herder; and Tress MacNeille (“Mickey and the Roadster Racers“) as Bob’s Mom. “Puppy Dog Pals” stars Issac Ryan Brown (“black-ish“) as quick-witted, problem solver Bingo; Sam Lavagnino (“Miles from Tomorrowland”) as silly, energetic Rolly; Tom Kenny (“SpongeBob SquarePants“) as A.R.F; and Jessica DiCicco (“The Lion Guard“) as Hissy. Games and activities featuring Bingo and Rolly will be available on the Disney Junior app and DisneyJunior.com beginning Friday, April 7. Brand extensions from Disney Consumer Products and Interactive Media such as activity and story books will be available beginning June 2017 with apparel and toys launching in August 2017. The series is a production of Wild Canary in association with Disney Junior. What do you think? Will your family check out the new Puppy Dog Pals TV series? Let us know, below. More about: Disney Junior TV shows: canceled or renewed?, Puppy Dog Pals, Puppy Dog Pals: canceled or renewed? Absolutely the best cartoon ever my Great-Grand-Daughter is 18 months old and is glued to Puppy Pals I would buy every episode if I could find them. Please do not cancel the puppy dog pals my two granddaughters love love the show. Waiting for t-shirt and toys come out was hoping merchandise was out for one of their birthdays. They also love the lion guard they are watching the tape shows.